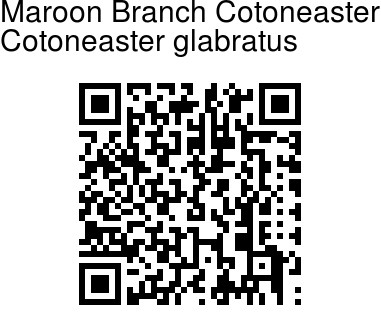 Maroon Branch Cotoneaster is a shrub or small tree, 3-6 m tall. Branchlets are robust, purplish red to purplish black, round and shining. Leaf stalks are 5-7 mm. Leaves are oblong-lanceshaped to oblong-invert- lanceshaped 4-9 cm long, 1.5-3.3 cm broad, lateral veins 7-10 pairs. Leaves are glaucous on the underside and the tip pointed or long-pointed. 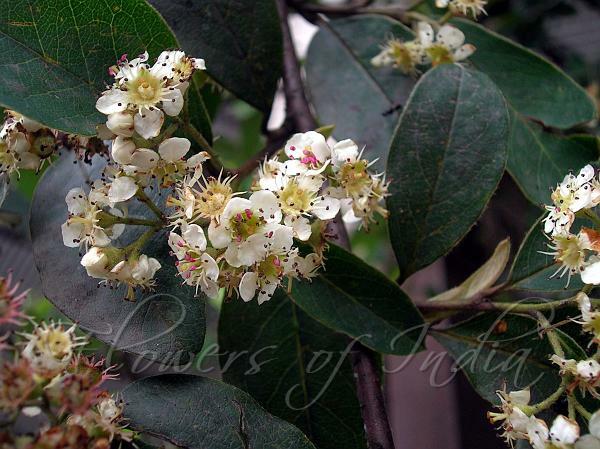 Small white flowers are borne in compound corymbs 3-6 × 3-5.5 cm, densely many flowered. Flower-stalks are 2-3 mm. Flowers are 7-8 mm across. Sepals are ovate-triangular, 1-2 mm, pointed. Petals are spreading, white, ovate or circular, 2.5-3 × 2-3 mm, base shortly clawed. Stamens are 20, unequal in length, anthers purple. Styles are 2, free, somewhat not exceeding stamens. Fruit is is a red berry, 4-5 mm in diameter. This shrub is found on Rocky slopes, dense forests in SW China and Arunachal Pradesh, at altitudes 1600-3000 m. Flowering: June-July.